Title: 03/31/1989 - Applicability of the HCS to office workers and copy machine operators. This is in response to your letter of March 3, on behalf of your constituent, Mrs. Brenda Schissler, concerning the Material Safety Data Sheets (MSDS) requirements of the Hazard Communication Standard (HCS). The HCS provides workers exposed to hazardous chemicals with the right to know the identities and hazards of those chemicals, as well as the appropriate means to protect themselves from adverse health effects. Any chemical that poses either a physical hazard (such as flammability) or a health hazard (such as causing damage to the skin or eyes) is covered by the rule. A booklet describing the requirements of the standard is enclosed for your use. Employers who use chemicals will receive information about them from their suppliers. this information will be provided through labels on containers of hazardous chemicals, and material safety data sheets - bulletins which provide more detailed data regarding the hazards and recommended protective measures for the chemicals. Each employer with employees exposed to hazardous chemicals must have a hazard communication program, chemicals and how to protect themselves from those hazards. There is no requirement for employers to maintain MSDSs for products that are located at other sites. In the situation described by Mrs. Schissler, if her employees are exposed to hazardous chemicals during the course of employment at another employer's site, that other employer must make the MSDSs available to Mrs. Schissler's and/or her employees. In other words, the chemicals are under the other employer's control, and thus maintenance of MSDSs on the sites is that employer's responsibility. If Mrs. Schissler's employees are being placed in workplaces where they will be exposed to hazardous chemicals, then she is responsible for ensuring that they are provided proper training. Mrs. Schissler could accomplish this by providing the training herself, or ensuring that training is provided as part of the contracting arrangement with the employer using the services of her employees. 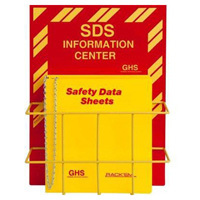 In any event, part of the training must deal with the location and availability of MSDSs Mrs. Schissler could satisfy her duties in this regard by requesting access to the data sheets from the employer at the site, or by training her employees to request such information when they ascertain that their duties involve exposure to hazardous chemicals. It appears that Mrs. Schissler's employees are clerical workers. If this is the case, they may not be subject to the requirements of the HCS. Office workers who encounter hazardous chemicals only in isolated instances are not covered by the rule. The Occupational Safety and Health Administration (OSHA) considers most office products (such as pens, pencils, adhesive tape) to be exempt under the provisions of the rule, either as articles or as consumer products. For example, Mrs. Schissler specifically mentioned copy toner. OSHA has previously stated that intermittent or occasional use of a copying machine does not result in coverage under the rule. However, if an employee handles the chemicals to service the machine, or operates it for long periods of time, then the program would have to be applied. Under the Occupational Safety and Health Act, States are encouraged to assume responsibility for their own occupational safety and health programs under a plan approved and closely monitored by Federal OSHA. As you are aware, the Kentucky Labor Cabinet is operating under such a plan and is responsible for the enforcement of occupational safety and health standards in the State's workplaces. As a condition of plan approval, States are required to adopt and enforce occupational safety and health standards that are either identical to or "at least as effective" as the Federal standards. Kentucky is enforcing an identical HCS which is applicable to manufacturers and non-manufacturers. If we can be of further assistance to you regarding occupational safety and health matters, please let us know.